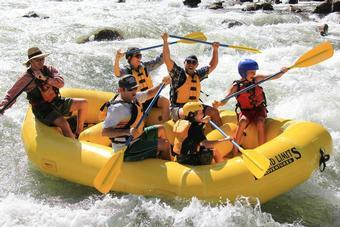 Raft the entire 21 mile long South Fork American River in 2 days with 4 meals and 1 night camping at our resort included. Our 2 day trip features guided rafting on both sections of the South Fork - The Lower Gorge section on Day 1 and the Upper "Chili Bar" section on Day 2. Beyond Limits Adventures is the number 1 rated outfitter on the South Fork American. Quite simply, no other outfitter in California can offer you a 2 day rafting package as completely fabulous as our 2 day South Fork American River trip. Comfortable river front camping sites on manicured green lawn! Outdoor patio with cold beer, local wines and beverages. Delicious buffet meals prepared fresh by our staff every day! Beyond Limits Adventures takes it to a new level!!! 10:00AM Our 2 day trips begin when you and your group checks in at River Park Resort. 1 night camping and continental breakfast prior to your trip is available if you would like to arrive the night prior to your trip, please contact us for this option. 11:00AM Rafting begins on the 12 mile Lower Gorge section of the South Fork, depending on water flows we will launch from camp and eat lunch on river at a private beach afew miles down, or we will delay the launch and eat lunch at our resort prior to rafting. This depends on when the water flows rise each day from the upstream dam release. A deli style lunch will be served with sandwiches, fruit, salads and drinks. 4:30PM At the end of the trip we'll board the shuttle bus at Folsom Lake and ride back to camp. When we arrive at camp you can enjoy a cold beer or other beverage at our daily "Happy Hour" and then check-out your photos from the "gorge". 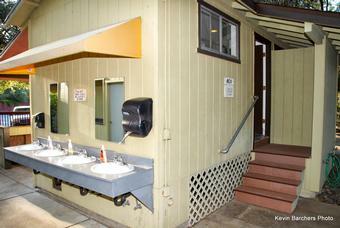 Back at camp you are free to relax and enjoy our facilities. On weekday trips we do not include dinner but there are several restaurants within walking distance from camp which we recommend. 8:00AM (Day 2) Breakfast is served at our resort. This hot breakfast features egss, sausage, biscuits, fruit salad, coffee, tea and juice. 9:00AM (Day 2) Board the shuttle bus for a ride to "Chili Bar Put-in". 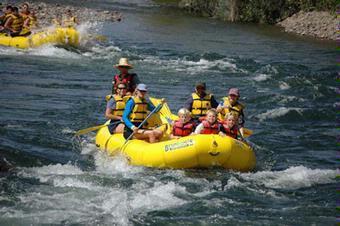 Once we arrive to the river we will raft the fun and non-stop rapids of the upper South Fork. "Meatgrinder" and "Troublemaker" are the biggest rapids of this section. 1:00PM (Day 2) Lunch is served back at camp. This bbq lunch features chili dogs and veggie burgers along with salad, fruit and dessert, After lunch you can view your photos and enjoy a cold beverage at our outdoor bar and grill. You are free to depart back home after lunch. 9:00AM Our 2 day trips begin when you and your group checks in at River Park Resort. 1 night camping and continental breakfast prior to your trip is available if you would like to arrive the night prior to your trip, please contact us for this option. 10:00 AM After everyone is checked in our trip leader will begin a safety talk and orientation about the river. We'll then suit up and put in at our beach. The first 3 miles is a good warm-up of class 2 and 3 rapids. 12:30PM We will pull over and have lunch at our riverside lunch spot. Lunch is a deli-style buffet with sandwiches, salad, dessert and drinks. 1:30PM - We get back on the river and look forward to the rapids of the amazing "lower gorge" section of the South Fork. This fantastic section of whitewater includes "Fowler's Rock", "Satan's Cesspool", "Upper and Lower Haystacks" and "Hospital Bar" along with other class 3+ rapids. Photos of your raft will be taken at several of these fun rapids. 4:30PM -At the end of the trip we'll board the shuttle bus at Folsom Lake and ride back to camp. When we arrive at camp you can enjoy a cold beer or other beverage at our daily "Happy Hour" and then check-out your photos from the "gorge". 7:00PM Dinner will be served by our staff on our outdoor dining patio at 7:00PM. Dinner features Bar be cue tri-tip beef, grilled chicken, fresh vegetables, salads and deserts. Beer and wine is available for purchase with your dinner for adults. Non alcoholic drinks are available as well. After dinner you can relax at camp, sit by the campfire, or play games in our game room. 8:00AM- Day 2 - A full breakfast is served at our dining patio. 9:30AM - Our shuttle bus will depart from camp for the Upper "Chili Bar" put-in. This section of river is shorter than Day 1 but it has 2 rapids that are bigger than the rapids on the Lower Gorge. 10:00AM - We arrive to the put-in and board the rafts. The action starts right away on the upper section of the South Fork. Within 1 mile we'll be running a long technical rapid known as "Meatgrinder". After this the rapids come in quick succession, with "Racehorse Bend", "Triple Threat" provided the thrills. The last big rapid of the trip is the grandaddy of them all... "Troublemaker". Known to make or break many a river trip, we'll roll the dice and see what comes up! 2:00PM - We arrive back at camp where a bountiful barbecue lunch will be prepared by your friendly and hardworking guide. 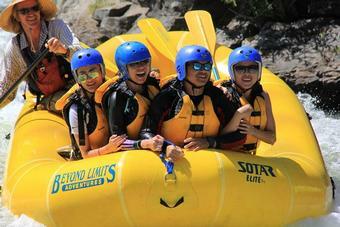 You may view your photos of another great day of rafting and prepare for your trip home. Enjoy the food, relax and tell your stories about this excellent 2 day rafting trip with Beyond Limits Adventures! Driving from Sacramento: Take highway 50 east from Sacramento to the Ponderosa Road/ Shingle Springs exit - EXIT NUMBER 37. (You will be following signs to Coloma). At the end of the ramp, turn left, and go over the highway. There are two stoplights immediately after the overpass, take a right turn at the second stop light (North Shingle Road). Take North Shingle Road approx. 4 miles until it becomes Lotus Road. Take Lotus road until it stops at highway 49, turn left. Go over bridge and turn left on River Park Dr., there is a left-hand turning lane just after the bridge. There is also a Pizza place and Lotus Arts Studio here. Follow River Park drive to the left and into our resort. 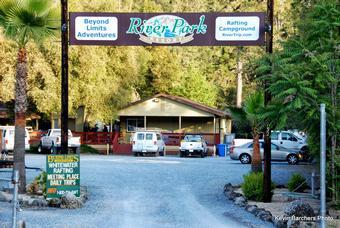 Our Resort is marked by a large brown "River Park Resort" and "Beyond Limits Adventures" sign. It is a good idea to arrive at least 15 minutes before your trip departure time to allow yourself time to check-in, use our restrooms and change into your river attire. Each trip has a designated departure time, make sure you know the time and plan to arrive before it. It is better to be early than late. We do not hold up trips for late arrivers. 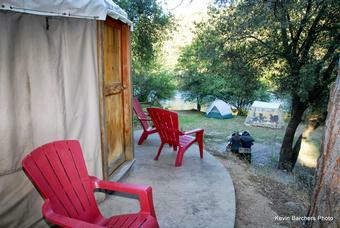 One night camping at River Park Resort is included with all 2 day South Fork American River trips. 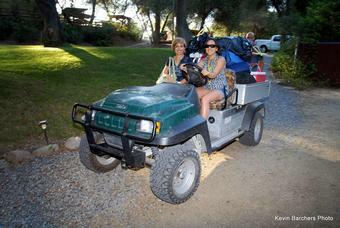 You may add 1 additional night of camping prior to your day 1 rafting trip. Please contact us if you plan to arrive the night before your trip. You should bring all the camping gear that you need. Otherwise you may rent it from us during your stay. Includes 2 days of rafting, 2 nights of camping (1 night complimentary prior to trip and 1 night during), cabin tent upgrade available and 4 meals.